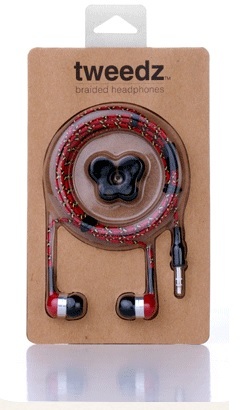 The good folks over at K&J's Critiques wrote a really nice Tweedz Braided Headphones Review and even included us in their 2013 Holiday Gift Guide. Here is an excerpt of the review. Head over to their site to read the whole article. Hi, my name is Kellie and I'm a music-aholic. I admit it. I would listen to music from the time I awaken to the time I fall asleep if I could get away with it. However as much as I love music, I hate the aggravation that always sometimes comes with listening to it, nothing against the music itself but more the headphones that I have used. There are all kinds of little gizmo's and gadgets that say they won't tangle your headphones and after trying a few myself they all proved to not work properly. So what is the next best thing? How about tangle free headphones? I had heard of it, but the price on most of them were outrageous and the reviews were not so great either. That is until I came across Tweedz. I was instantly impressed by them just by the reviews listed on Amazon, not only were the reviews fantastic but the price was great compared to others I had come across. I loved the packaging, as you can see above they do not come twisted up like most others I do, I had no problem unraveling them right out of the package. It also comes with three different size inserts for your ears. The sound quality was fantastic! I am quite picky about the sound that comes out of headphones and speakers, sometimes it sounds almost shallow with no bass, there was no issue with Tweedz doing that at all. Tweedz would make a wonderful gift to someone special or even as a gift to yourself. Shipping was fast, customer service was fantastic and the product is definitely up to K & J Commodity Critique standards!